This MoonTide forecast showed a sharp trend reversal near 11:00, so the 1ADay trade was set up to go with the trend or trend reversal just after 11:00. Protection plan was to trail a 3 point stop that moved 1 point every 30 minutes after entry, and to cover on a 9 point gain, at 12:45, or on a 17 point range. 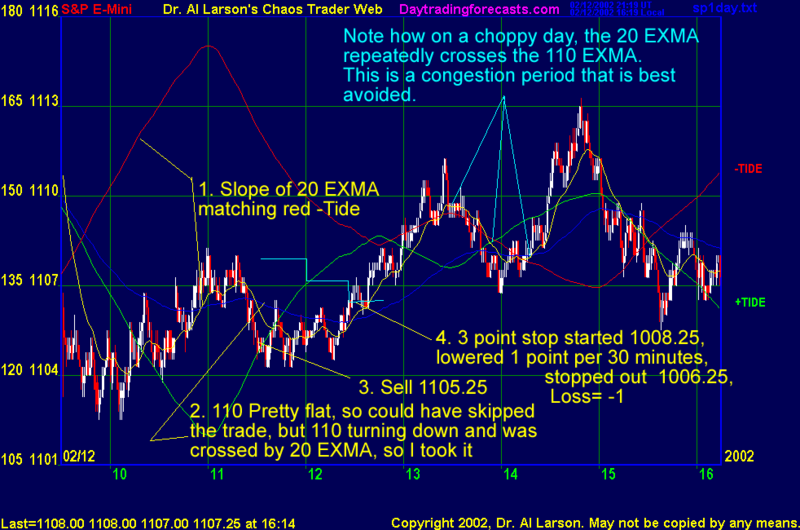 The instructions were to watch for the 110 EXMA to start moving, or reverse, and to use the yellow 20 minute EXMA as an entry tool, entering when it crossed or dipped toward and pulled away from the 110 EXMA. This trade wound up being a loss. Losses are a part of trading. What happened here is that the turn traded turned out to be a minor one in a congestion pattern. The market followed "mixed Tides." We gave this trade enough of a chance to work, and the stop got us out properly. Tomorrow is another day. Note also that the market was choppy all day. While there were good turns on the forecast times near 1:30 and 2:45, that trading them would have required quick reflexes and settling for small gains. That's fine if you want to do that. But if you do, restrict your trades to MoonTide turns that are confirmed by the trackin EXMA's.